In this News, we present another FSI simulation performed using ADINA in the car industry. 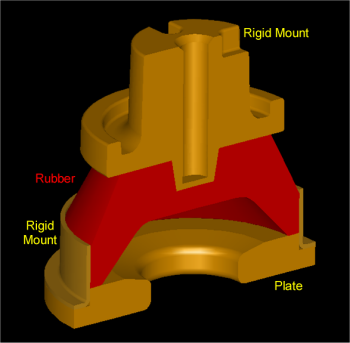 This time, the component simulated is the hydromount shown in Figure 1 below. The objective of the simulation was to evaluate the stiffness of the hydromount at different operating frequencies. 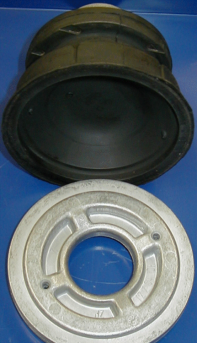 The rubber part of the hydromount experiences large deformations and contact with the metal mounts and the plate. The fluid is viscous incompressible and described by the Arbitrary Lagrangian-Eulerian formulation. The direct monolithic solver is used in ADINA for this FSI solution due to the strong coupling between the solid and the fluid. The hydromount was first subjected to a static pre-load, followed by different transient dynamic analyses at different excitation frequencies. The animations above show the maximum principal stress in the rubber, and the velocity in the fluid at two excitation frequencies, 10 Hz and 400 Hz (note that the animations are shown at the same speed). 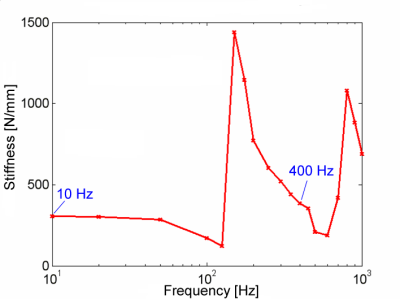 The stiffness of the hydromount for a wider range of frequencies (up to 1000 Hz) is shown in Figure 2. This solution, like others presented in our earlier News and our Fluid-Structure Interaction web page, illustrates the wide range of fluid-structure interaction problems that can be solved with the ADINA System. This problem was provided courtesy of Dr. Heck Consulting and Engineering, Germany.